Not all luck-bringing papers are couplets. Some are four-character-phrases that express traditional sentiments for a rich and bountiful spring. Still others are single characters, for example, the Chinese character "fu(福)". Posting the "福" (pinyin: fú; jyutping: fuk1) character is a tradition for Chinese people during Spring Festival each year. "福" is difficult to translate into English; it means something like "幸福" (xìngfú; happiness, blessing, well-being, being satisfied with one's life) and "福气" (fúqì; good luck, good fortune). 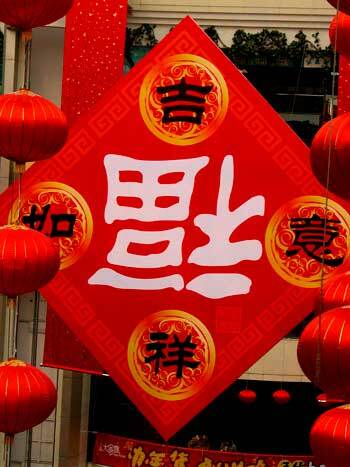 Posting the "福" character represents people's wish for a good life and happy future. The "福" character is often posted upside-down. It is said that this is because the character for "upside-down", "倒" (pinyin: dào; jyutping: dou3), is a homonym of the character for "to arrive", "到" (pinyin: dào; jyutping: dou3). So this means that "福" (happiness, good fortune, etc.) is "arriving". The first interpretation has the practice of pasting ´fu" during Spring Festival originate in Jiang Ziya of the Zhou Dynasty (11th Century-256 B.C.). When Jiang Ziya was made a god, his wife demanded to be made a goddess. "After I married you I was always in poverty in my life," Lord Jiang said. "Seems you are destined to be poor. So let me appoint you as the Goddess of Poverty." No knowing what being the Goddess of Poverty held in store for her, his wife was nevertheless happy about becoming a goddess. Cheerfully, she asked, "Now that I´m the Goddess of Poverty, where shall be my domain?" Jiang replied, "You are off limits wherever there is good fortune." When the residents got word of Jiang´s instruction, they wrote the character "fu"on paper and pasted it on the doors and windows of their houses to keep the Goddess of Poverty away. Thus pasting ´fu" during the Spring Festival became a Chinese tradition. It also said that Emperor Zhu Yuanzhang(founder of Ming dynasty) once used the character "fu(福)" as a hidden signal to prepare killing someone. The kind-hearted Empress Ma decided to eliminate the tragedy of killing, so she ordered everyone in the city to put a label with the character "fu 福" on the door of their house before the sun rises the next day. Everyone followed Empress Ma´s order , but one family is illiterate and pasted the label with the character "fu 福" upside down. On the 2nd day, the emperor ordered his officer to go to the city and found that every family had pasted the label with the character "fu 福", and with one family having the character "fu 福" upside down. The emperor was very angry and ordered that family be executed. Empress Ma realized the incidence and told the emperor "that family knew you´re coming today, so purposely turn the label upside down. Isn´t that the same meaning as ´Luck arrives´?" After hearing this, the emperor immediately released the family and a tragedy was averted. From then on, people began to paste the label with the character "fu 福" with the purpose of hoping for auspiciousness, and another to honor Empress Ma. The third interpretation attributes the practice to Fu Jin, the princes of Gong of the Qing Dynasty. Once, on the lunar New Year´s Eve, the butler of the mansion of the Prince of Gong wanted to curry favour with his master. He followed past practice and had several large "fu" written and pasted on the front gates of the warehouse and the mansion. One of the men sent to do the pasting was illiterate and put the character upside down on the front gate of the mansion. Enraged, the prince wanted to punish the perpetrator by whipping him. The butler, who had the gift of the gab, hastened to go down on his knees and pleaded: "Your humble servant often heart people say that Your Excellency is a man of longevity and great fortune. Indeed great fortune did arrive today; it is a good sign." The prince was convinced. "This is why the passers-by were saying that great fortune had arrived in the mansion of the Princess of Gong," he thought. "Once an auspicious saying is repeated for a thousand times, my wealth could increase by 10,000 taels of gold and silver." He then awarded the butler and the servant who pasted the paper upside down fifty taels of silver. Since then the practice of pasting "fu" upside down during Spring Festival has become a tradition followed by both imperial aristocrats and commoners.